June is not my favourite month in the garden. I think it has a lot to do with my impatience. Looking at those little plants, I wonder how they will ever make it. Let’s face it, they really only have two, maybe three more months to grow, bloom, and bear fruit. Thankfully we have been gardening long enough to know they will make it (if the hail does not kill them). Plus this year really has been better than some other years. Speaking of hail, an all time present danger here because we live in the hailstorm alley, the most hailstorm-prone area on Earth. I know, makes you want to garden here, eh? 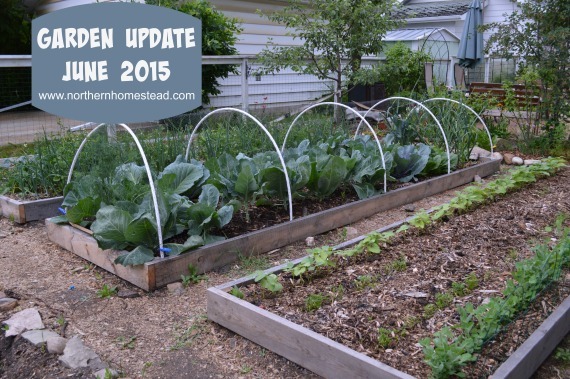 The hail came very early this year, but thankfully was not as damaging as last year (See July garden update). We sure hope this was it for this year’s hail. Sadly it does not always work that way. 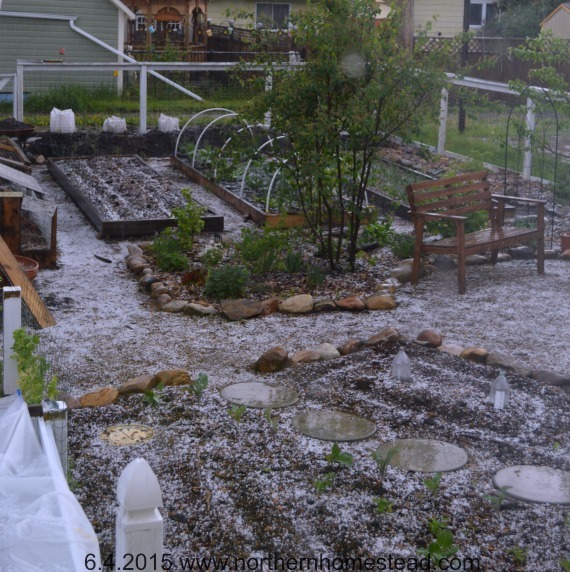 I often pray that God would protect our garden from damaging hails. And I must say that we do grow lots of food year after year. June is our rainy month, usually. We got some rain this year too, but not a whole lot. Thankful for the wood chips that we covered our garden with. The Back to Eden gardening method is so good. Even though it is dry, plants grow well. The raspberries that we transplanted this spring are loaded with blossoms. We did water them, so the plants would establish better. And we mulched them with wood chips. The grow bags container gardening on our drive way need constant watering too, and do very well. Some fruits are starting to ripen (remember, it is June!). 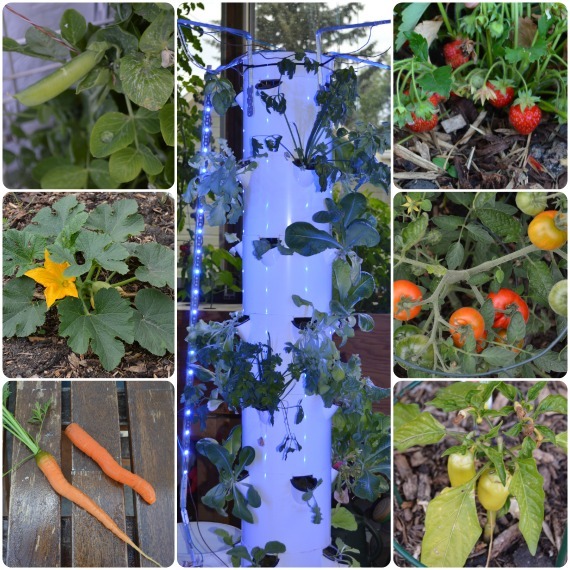 Growing tomatoes outdoors in cold climate seems to be best in grow bags protected with some glass panels. One thing that I really like about living in Alberta is the sunshine! We get lots of it! 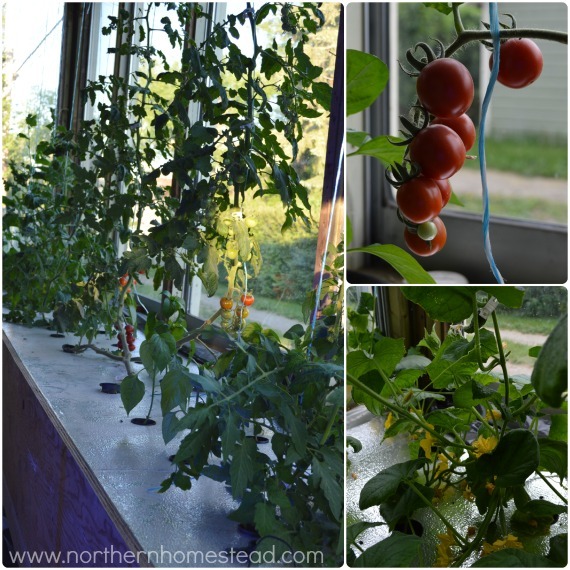 The hydroponically grown plants in the greenhouse need lots of sunshine. With a late start, except the two Kratky method tomato plants, they all are doing very well. We had our first tomatoes the other day, and our first cucumber – what a treat! Meanwhile our cucumbers outside have not even started blooming yet :(. So far we are very pleased with aeroponics in the greenhouse. We got a watermelon plant from Alberta gardener, thank you! 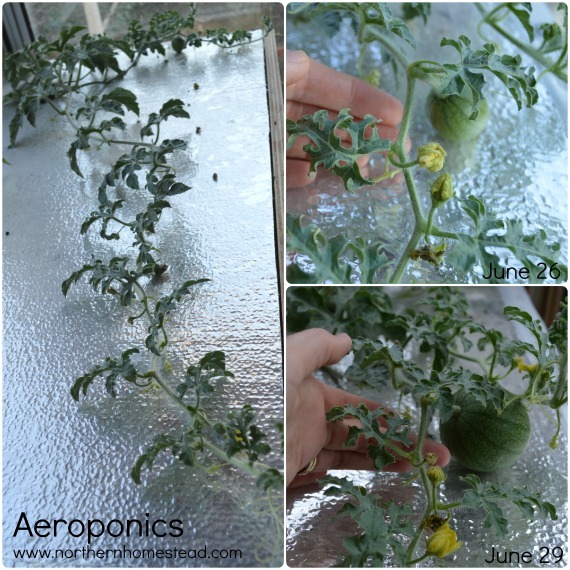 Since it is too cool for water melons in our outside garden, and we only have hydroponics in the greenhouse, it had to become a hydroponic plant, too. Jakob washed all the dirt off and placed the roots into a hydroponic net pot, the plant is doing very well. It looks like it is growing by the hour. See the picture of how much it has grown in 3 days. Aeroponics does grow very fast. Due to unusually dry and warm weather we have enjoyed many things from our garden already. 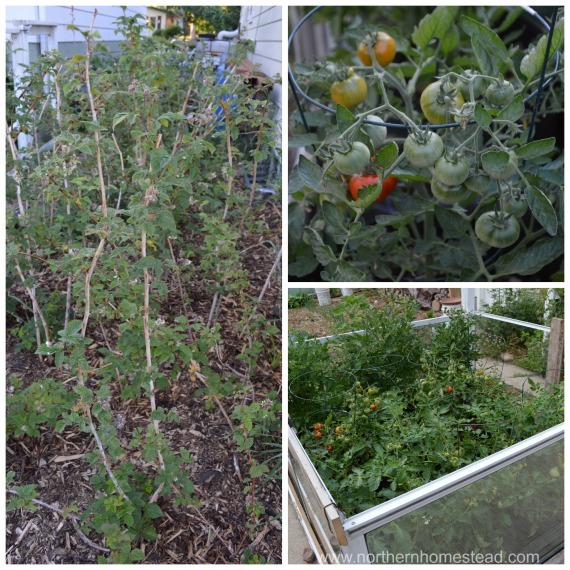 Now that June is over and summer is officially here, we hope for lots more growth and produce in the garden. How is your gardening weather? That watermelon is looking great Anna! From the looks of it your fruit is doing better than mine size wise so it must really love the aeroponics. Yes I am amazed too how well it does, thanks again for the great plant! To experiment with aeronautics is really fun, i was surprised how easy a soil plant can become a hydroponic plant.